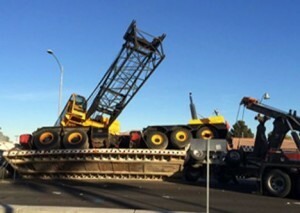 A five axle truck crane being moved across Las Vegas on a low loader partially overturned yesterday at a busy intersection. The superstructure of the crane, an American Hoist lattice boomed crane owned by Reliable Crane Service, appears to slewed over the side, causing the overturn. The counterweight landed on the road preventing a full overturn, and the crane remained firmly strapped on the trailer bed. Two wrecker trucks were called in to pull the trailer back upright and the street was opened again by evening. No one was hurt in the incident. a while that isn’t the same old rehashed information.